Home » Play » Wednesday Window: Robots! This week has been all about robots. 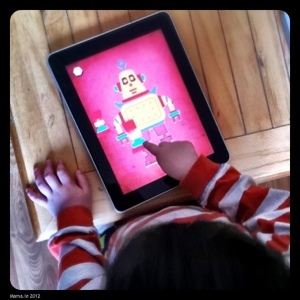 Little Man has been playing Robot Workshop on the iPad and the iPhone. Such a simple little app. It’s essentially a shape sorting/simple jigsaw app, where you move each piece into place to make the robot. There are 12 different robots to choose from. We’ve made them all several times now. 🙂 Thanks a million to the Apps for Parents group on Facebook for suggesting it!